Backwater Paddle Company is proud to announce that Outdoor Specialty Innovations(OSI) will become the exclusive distibutor of Backwater Paddle Company paddle products throughout the US, Canada, Mexico and Australia. Late October, OSI approached Backwater Paddle Company wanting to market, distribute and sell our legendary Predator and Piranha Kayak Fishing Hand Paddles. Ron Basket, CEO and founder of Outdoor Innovations (OSI), a Nevada based company, is dedicated to the development and discovery of innovative products designed to ease and heighten the joy of the fishing experience. Ron has come up with answers to some of these perennial fishing frustrations with his own line of Easy2Hook non-threading loop tie fishing hooks and the company’s patented clip-on Bait Strap bait and attractant holder line of products. Integrating the innovative paddle concepts of Backwater Paddle Company with Outdoor Specialty Innovations patented fishing tackle and accessories is a natural path for mutual growth and prosperity. Paddle sportsmen are clamouring for the latest and greatest gear, equipment and accessories. OSI has experience in outdoor marketing and sales, having attended the 2010 ICAST show in Las Vegas earlier this year. OSIs employment will launch Backwater Paddle Company into the paddle sports and fishing markets sooner and more efficiently. Outdoor Specialty Innovations’ Easy2HookUSAs, non-threading loop tie line of fishing hooks, exemplifies how practical solutions solve the difficult and time consuming process of attaching your fishing line to an open eye and even more difficult, spade-end hook. But not anymore! OSI made it easy with the ultimate fishing hook you can attach to a line in five seconds! Backwater Paddle Company’s Predator and Piranha Kayak Fishing Hand Paddles will continue to be manufactured and headquartered in Central Florida. Our regional sales force and company dealerships will continue to grow, working under the auspices of Outdoor Specialty Innovations. Backwater Paddle Company’s future plastic and composite line of paddles are working their way through the designing and testing phase. In the works are another plastic/structural foam kayak fishing hand paddle, the Raptor Kayak paddle and the Havoc Canoe paddle, all reflecting Backwater Paddles patented “hook and teeth” blade designs. This entry was posted in Backwater Paddle Products, Marketing My Company and tagged fishing, kayak fishing, kayak fishing hand paddle, kayak fishing hand paddles, kayaks, paddle sports on November 20, 2010 by Paddleman. Brad Wiegmann, outdoor writer, sportsman, photographer and professional fishing guide took the time to review our Piranha and Predator Kayak Fishing Hand Paddles. Nota, Nota, Nota going to do that again. I ended up the creek without a paddle. You think that’s funny don’t ya. Well, it’s not exactly what you think. See, I had my long 220 cm high-strength, air-grade 7075 T6 aluminum shaft with high impact ABS plastic blades, but the long, dangling vines and branches were making it impossible to use. So, I was literally up the creek without a paddle. At least one paddle that I could use to get around with and fish. I am not the only kayak angler who faces this dilemma every time they go out fishing. The longer paddles of course are great for getting to where you are going to fish, but only seem to be in the way once you start fishing. That’s what Ed Halm, owner of Backwater Paddles discovered. His solution was to design a hand paddle that anglers could use to control their kayak while fishing. Interestingly, Halm not only designed and built one hand paddle, but two: Piranha and Predator. Both are designed for anglers when kayak fishing, but built different to accommodate what kayak the angler is fishing out of. The Piranha weighs 7-ounces with a blade size of 5” x 12” and total length of 19-inches. Piranha’s longer length makes it ideal for anglers fishing from sit-on-top kayaks. The Predator weighs 6-ounces with a blade size of 6” x 9” and total length of 15-inches. Predator’s shorter length makes it perfect for anglers fishing from sit-in kayaks. Both are waterproof and have a wooden blade and handle. Backwater Paddles (www.backwaterpaddles.com) are made in the U.S.A. and 100% guaranteed against breakage. 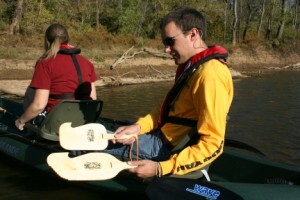 Hand paddles can be used by anglers, hunters, or even photographers to control their kayaks. “Some of the benefits to using a hand paddle include being able to control the kayak with one hand so you can fish with the other and not have to lay down your fishing pole; you can also use them in skinny water or around thick cover and brush like mangrove trees. The hook also allows anglers to pull themselves next to docks, grab trees, snag lines, and maneuver their kayaks,” explain Halm. The Backwater Paddles come with a wrist strap that anglers can put around their wrist to keep from dropping or losing it. Being shorter in length than a standard two bladed paddle, anglers can store them inside their boat or hook them onto the side. It’s common to see anglers using the hand paddles in skinny water. The blade length allows the angler to control the kayak and stalk fish effortlessly; however hand paddles shouldn’t be overlooked in moving water. “Hand paddles are great in moving water like rivers and streams. They can be used to control your drift and flow with the current. ; in addition to paddling yourself to a shallow spot, eddy, or like a rudder to guide the kayak,” said Halm. Are you going out fishing from a kayak? Would you like to fish more than paddling trying to control your kayak? When it comes to fishing more than paddling you are better off with a hand paddle. The smaller compact paddles can be used to maneuver your kayak with little effort making it easier to sneak up on fish in shallow water. Plus they can be used as a backup in case your longer paddle breaks. You won’t want to find yourself up a creek without a paddle would ya? We appreciate your time and consideration Brad! This entry was posted in Backwater Paddle Products, Marketing My Company and tagged fishing, kayak fishing, kayak fishing hand paddle, kayak fishing hand paddles, kayak paddles, kayaks on November 12, 2010 by Paddleman. I was first introduced to Backwater Paddles earlier this year. When I first saw them I was skeptical, I didn’t think the paddle had a place in my already cramped kayak. Little did I know, the Backwater Piranha was going to become a mainstay on my kayaks. My first use came on the Georgia Kayak Fishing Tournament Trail. The Lake Harding event made for a great proving ground – the waters were high and fast. Holding over an area without an anchor was going to be difficult, and this is where we kayak anglers usually fish with a rod in one hand and an 8′ paddle in the other. I think it’s safe to say that this isn’t the most ideal situation. I took my regular paddle out of my lap whenever I wasn’t paddling to my next spot – that is to say, fishing. The Backwater Paddle made keeping my spot easier. I wasn’t fighting 8 feet of paddle lying across my lap or in one of my hands. I was able to make adjustments to my position with the Backwater Paddle with very little effort, and without the splashing around you’d normally get with a standard paddle. This meant I was able to spend more time fishing, and less time spooking fish. It didn’t take long before this paddle impressed me. Fishing along jetties had me switching up between rod and traditional paddle to keep me off the rocks. The Backwater Piranha Hand paddle worked just as well to shove me off the rocks, and I didn’t have to put my rod down to do it. The cut edge gripped the rocks well and allowed a great push-off. It’s also come in useful when anchored in moving water. Sometimes water movement might sway you just out of where you wanted to be. This is definitely inconvenient right before you cast. I just drop the Backwater Paddle into the water and use the drag created to swing me back into position. By far the most important thing I found with the Backwater Paddle is efficiency. Kayak fishing is a very physically active sport. I’ve paddled as much as 12 miles in a day. Any amount of time I can spend not throwing around a heavier kayak paddle one-handed just to maintain position gives me more energy to get from hole to hole. The Backwater Paddle makes it easier to fish more water – that means you can catch more fish. The only issue I have for the Backwater Paddles is the finish. While this paddle has held up just fine in the last 7 months, I think an epoxy might be better suited. So far it’s held up in fresh and saltwater, so I my concerns with the finish probably are not warranted. I like the Backwater Paddle so much that I now have one paddle for each of my kayaks, and one to give anyone I might end up fishing with. They’re that nice to have. You can find this product at Backwater Paddle Company for about $19.95. Please feel free to leave your comments below if you have used this product or have questions and we will be happy to help. This entry was posted in Backwater Paddle Products and tagged fishing, kayak fishing, kayak fishing hand paddles, kayak paddles, kayaks, paddle sports on November 3, 2010 by Paddleman.